Order personalized piggy banks with removable tops at attractive wholesale prices from us. These customized piggy banks are largely preferred for building values and marketers love to gift these to kids! 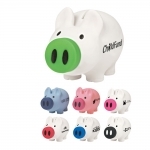 Customized piggy banks with detachable "snout" make a cost effective and value effective promotional choice for marketers facing a budget crunch yet who are still trying to indulge in purposeful marketing gifts. Logo piggy banks make great giveaways during tradeshows, business conventions, school events and individual celebrations, too. Artwork assistance and online design proof is offered FREE on all these products. All our custom printed piggy banks and other promotional giveaways for kids are covered with 100% customer satisfaction guarantee and 110% price match guarantee. Fast shipping and fast production times keep us ahead in the niche. 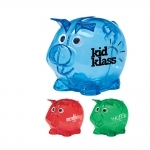 If you're trying to teach little ones about saving and getting financially secured, why don't you gift them these custom printed piggy banks with removable snouts? Most kids find them inspiring, indulging and worth trying. It's never too late to store coins in them and you can always help them to start with it on their birthday or any special day of their life. Schools, teachers, parent's councils, social organizations, fundraisers, charity organizations, financial businesses such as credit unions, insurances, banks, and all those who wish to acknowledge kids can order these piggy banks from us. Feel free to avail maximum value for your money by investing in these customized piggy banks with removable tops. The best part is these are easier to operate, the user only needs to remove the snout and start using it. At such affordable prices, these custom piggy banks have become the choicest gifts during trade shows, charity events, school events or individual celebrations. Made of lightweight and sturdy plastic with an easy to twist snout, you can easily transport them to the venues of distribution. The best thing about these custom printed piggy banks is that your customers will take note of your brand logo more often because every time they put in their money they will see your brand logo. 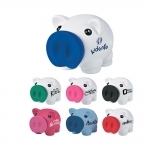 These promotional piggy banks with removable tops are offered in colors that everyone will love! Order enough of these custom piggy banks for your clients to remember you by. To know more about promotional possibilities, uses and benefits of these custom printed piggy banks, feel free to approach us at 855-454-3786 or email us at info@promo4kids.com.